Homemade Maple Brown Sugar Oatmeal. 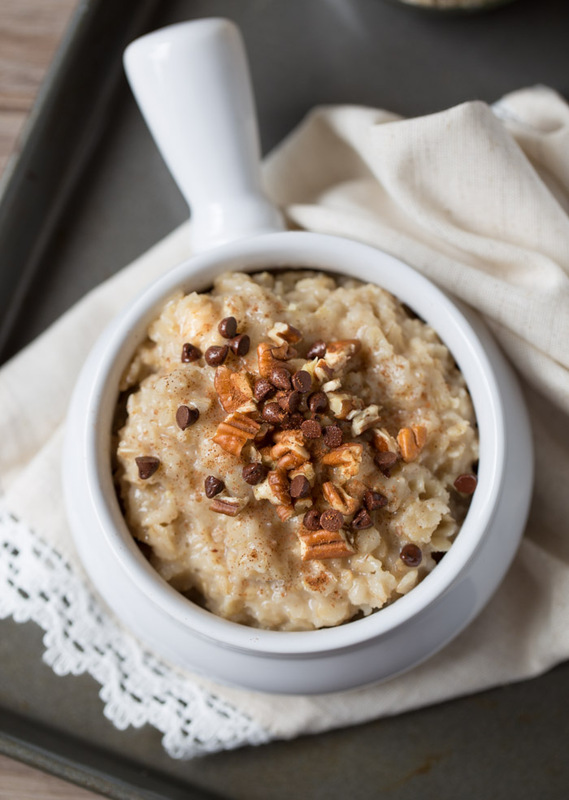 This easy homemade oatmeal recipe is made with simple ingredients including old fashioned oats, maple syrup, brown sugar and pecans. Make it at home, control the ingredients. Eliminate processed ingredients that are found in packet oatmeals. Control the amount of sugar in your oatmeal. I love making oatmeal for breakfast. It’s fast, easy and I can customize the flavor to whatever I’m craving on any given day. I used to buy packet oatmeal but that doesn’t happen anymore. Old fashioned oats are ready in 5 minutes. Adding favorite ingredients takes even less time. Maple brown sugar oatmeal has always been my favorite flavor. Adding pecans and mini chocolate chips makes it even better. The good thing about this oatmeal is that it can be made ahead of time. After preparing, place in storage containers and store in your refrigerator. In the morning, just grab and take along with you. My trick for preventing clumpy next day oatmeal is to add a dash of coconut oil to the oatmeal. The oatmeal stays smooth and creamy, just like it is right after it’s made. The other good thing about this oatmeal is that it takes less than 10 minutes to make. So even if you aren’t making it ahead of time, you can still have it ready quicker than the takeout window will. This homemade maple brown sugar oatmeal starts with old fashioned oats. You can use quick cooking oats too but adjust your cooking time accordingly. After the oats are cooked, half and half, maple syrup and brown sugar are mixed in. If making ahead of time, I add a pinch of coconut oil to the mixture. 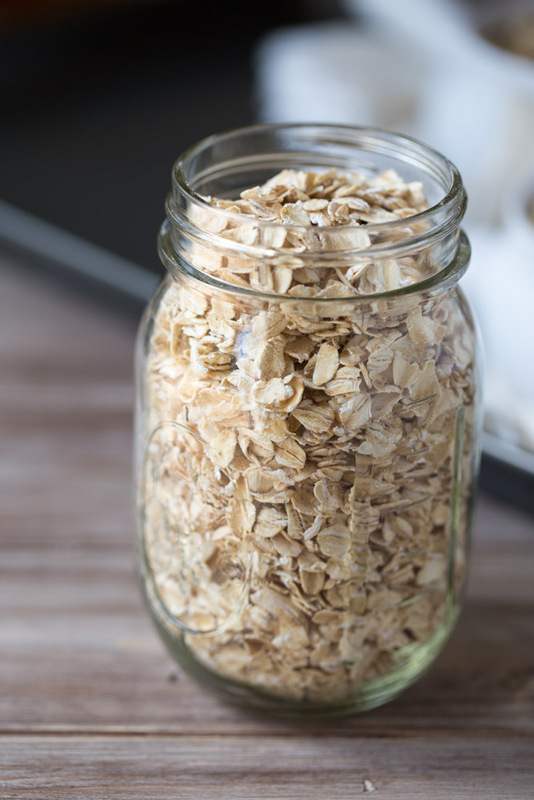 Place the cooked oatmeal into bowls or storage containers. Top each serving with chopped pecans and mini semi sweet chocolate chips. Add a sprinkle of cinnamon for extra flavor. To reheat make ahead oatmeal, microwave for 1 minute. OH, the other good thing about this oatmeal really isn’t about this oatmeal. It’s Friday. I have the next two days off. Life is good. HAPPY DANCE TIME! The good thing about this maple brown sugar oatmeal is that it can be made ahead of time. After preparing, place in storage containers and store in your refrigerator. In the morning, just grab and take along with you. My trick for preventing clumpy next day oatmeal is to add a dash of coconut oil to the oatmeal. The oatmeal stays smooth and creamy, just like it is right after it's made. Cook the oatmeal. Bring the water and salt to a boil. Add the oats and reduce the heat to medium heat. Cook for 5 minutes, stirring occasionally. Once the oats are done cooking, remove from the heat. Add the flavors to the oatmeal. Stir in the half and half, maple syrup and brown sugar. Place the oatmeal into bowls. 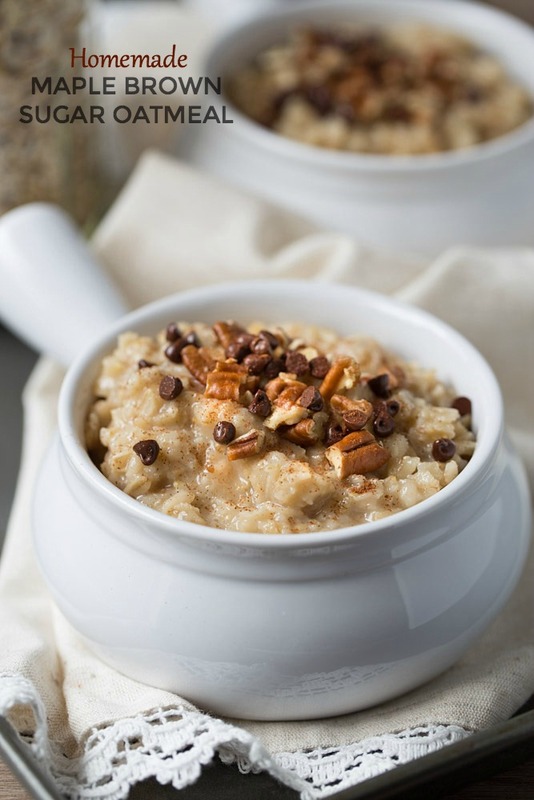 Top each bowl of oatmeal with pecans and chocolate chips. Then sprinkle with cinnamon, if desired. *If using quick cooking oats, adjust the cook time of the oats accordingly. The nutrition information is for four ½ cup servings. You can serve as two 1 cup servings too. The nutrition content will be altered if you use more or fewer pecans. 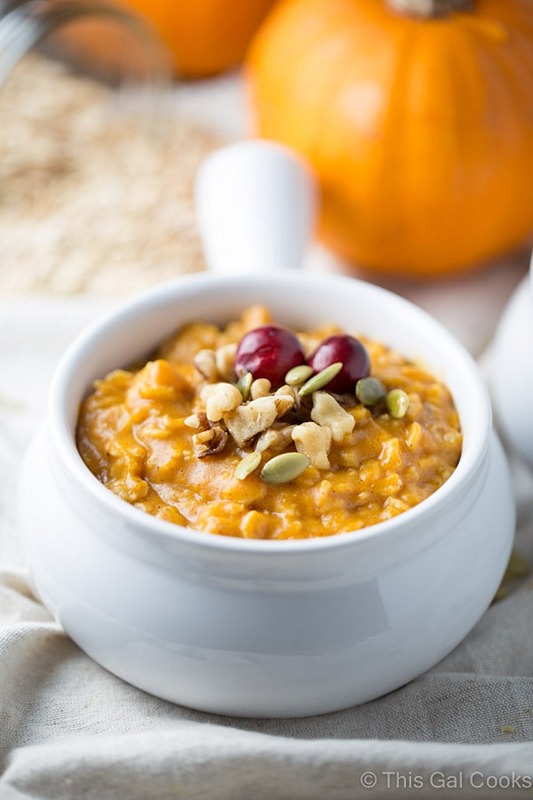 Love how quick and easy this oatmeal is Julie! I can’t resist brown sugar in my oatmeal! Brown sugar in oatmeal is the best, Christin! Thanks for stopping by and happy weekend! I’m glad it is lunch time, because this has made me hungry. Haha. What an easy way to start the day. I can smell it now! thanks for sharing & happy Friday! I heart oatmeal! This looks absolutely perfect Julie! This sounds like a great way to switch up my usual oatmeal routine! It’s a great addition to any oatmeal routine! Hope you enjoy it if you give it a try, Jessica! I be the real maple syrup and being home made makes a huge difference. It definitely does, Irene! Plus, I can control how much of everything is in the oatmeal to reduce the sugar content! I love the tip of a dash of coconut oil!! I will have to try it and this lovely oatmeal soon. Yum, yum, yum! What a perfect way to start the day! It sure is a great way to start the day! Thanks Tanya! Yum! I love oatmeal… perfect way to start my day! I love it too, Holly! It’s a perfect way to begin the day for sure! Julie, this oatmeal looks incredible! I’m totally craving oatmeal now since my attempts to extract it from my computer screen failed. Pinning! OMG, I hate when I cannot extract food that I want from my computer! Maybe one day technology will allow us to do that. ;) Thanks so much for the pin and your comment, Hayley! Oatmeal’s my brekky of choice, so I love this idea. Love the pecans and makes me feel less guilty about sometimes adding chocolate to my morning oatmeal. I always forget that you can pre-make oatmeal and then re-heat it. Great tip! This looks like the perfect bowl of oatmeal! Oatmeal is my favorite way to start the day and I love this maple and brown sugar combo! The coconut oil tip is genius, Julie! I seriously can’t wait to try that tonight! I love starting my day with oatmeal, too! It’s so easy to make! Hope you enjoy the recipe if you give it a try, Kelly! WOW – what a combination!! 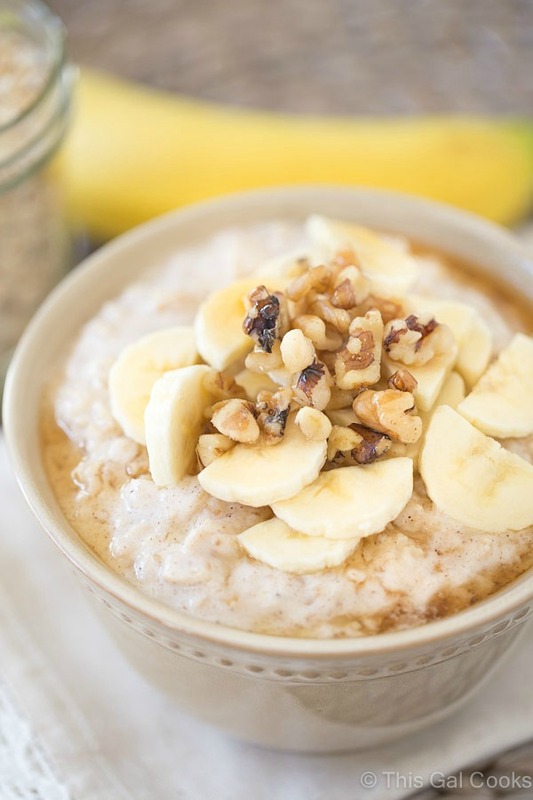 I love warm oatmeal year round and I really must try this version, pinned! Made this just now. So yummy!!! thank you for the coconutoil tip ! it all sounds great – except, I highly doubt anyone will even notice “a pinch of ” ! Even in a single serving this pinch would go unnoticed, which is a great shame, for cinnamon DOES make all the difference as it goes oh so well with the maple syrup. Half a teaspoon of cinnamon per bowl(!) is the minimum, I believe. Don’t worry, it won’t coverup any other flavours.